A pilot program to help people quit smoking by focusing interventions around the time of surgery led to significant improvements in provider referrals for smoking cessation counseling and patients’ sustained quitting in the 30 days following hospital discharge. A study on the program, titled “Evaluation of a Pilot Perioperative Smoking Cessation Program: A Pre-Post Study,” was published January 18 in the Journal of Surgical Research. Kaiser Permanente San Francisco implemented the perioperative smoking cessation intervention in the General, Orthopedic, and Vascular Surgery Departments as part of standard care in 2016. The intervention included multiple touch points to provide patients with repeated opportunities for smoking cessation education, advice to quit smoking, and links to existing resources for smoking cessation in Kaiser Permanente Northern California. The researchers examined pre-to-post intervention changes in outcomes among 276 adult smokers undergoing elective surgery in the year before (pre) and 2 years following (post) program implementation using electronic health record data and telephone surveys conducted approximately 30 days after hospital discharge. The study looked at provider outcomes, such as counseling referrals and cessation medication orders, and patient outcomes, such as counseling and medication use, smoking status on the day of surgery and 30 days following hospital discharge, and surgical complications. The study found that the percentage of smokers whom clinicians referred to smoking cessation counseling increased significantly from 3 percent in the pre-intervention period to 28 percent in the post-intervention period. Thirty days after hospital discharge, there were significant pre-to-post increases in the percentage of patients who reported that they had not smoked since leaving the hospital (18 percent to 39 percent) and those who reported that they had not smoked in the past 7 days (24 percent to 44 percent). Further, there were increases in patients’ use of counseling (5 percent to 12 percent), cessation of medications (6 percent to 8 percent), self-reported abstinence on the day of surgery (21 percent to 29 percent), and decreases in surgical complications (18 percent to 12 percent), but pre-to-post differences were not statistically significant. Historically, Kaiser Permanente has focused on a variety of clinical parameters affecting surgeries without a coordinated approach to continued tobacco exposure, but this new program takes advantage of the organization’s highly coordinated approach to health care. For many smokers, quitting smoking may be more important to their long-term health than the actual surgery. “This work is about doing the right thing for our members and surgical teams, both of whom value optimizing operative outcomes. We are well positioned to leverage our uniquely coordinated system to both detect those at risk and provide timely intervention to improve our tobacco cessation rates and health outcomes in Kaiser Permanente Northern California,” said study co-author, Renee Fogelberg, MD, a Permanente obstetrician/gynecologist and clinical lead for Tobacco Cessation in Kaiser Permanente Northern California. 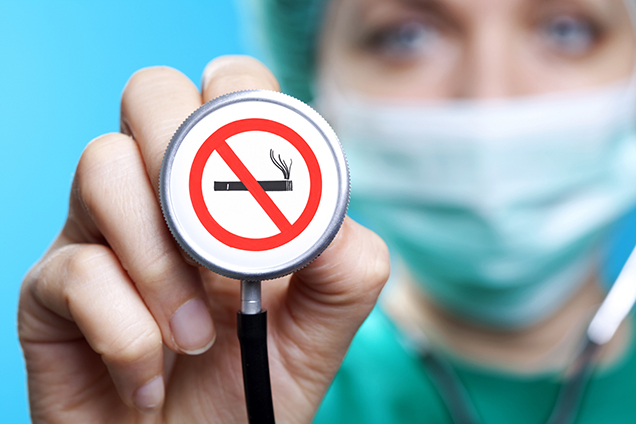 While the perioperative smoking cessation program reported initial successful outcomes, larger studies will be needed to fully evaluate its effectiveness. The program has been rolled out across Kaiser Permanente Northern California for all surgical patients and plans to study its impact on a larger scale are underway. The study was supported by a grant from the Kaiser Permanente Northern California Community Benefit Program. Additional co-authors on the study include Sara R. Adams, MPH, Kaiser Permanente Northern California Division of Research; and Alison A. Goldstein, MPH, Kaiser Permanente Northern California. Story reprinted from the Kaiser Permanente Division of Research site.